I recently had the pleasure of interviewing artist and jeweler Eduard Oganov, the creator of these beautiful pieces. Cherie: First, I want to tell you what a thrill it is to represent your work. Not only are the jewelry pieces that you create unique and beautiful, they are also very powerful. I have many clients who are avid collectors of your work. Eduard: Thank you very much. I am glad to talk with you. C: I was reading in your bio that when you lived in Russia, it was difficult to acquire semi-precious stones, and so you used to go into the mountains to find them. How has sourcing these stones changed since you came to the United States? E: It is true that in the Soviet Union finding stones was almost impossible. The only source was nature – people had to go into the woods, mountains, and river beds, to find semi-precious stones. These stones on the outside looked like any rock you’ll see on the road, but once they were cut, the beauty of the stone was revealed. I had to find the right angle in the patterns of the stone to cut it properly – one wrong move and the stone could become unusable. Because of the difficulty in finding already cut and polished stones, I had to learn how to do this myself. My friend from a city in Ural mountains knew how to find and cut the stones, and he taught me how to do it. This is how I got access to multitudes of semi-precious stones in Russia. In the United States one can buy pretty much any stone in a specialty jewelry store, but I find that most of these are very “dead” – they do not have life in them. This pressed me to go and find access to the “alive” stones – through many people. C: Can you tell us how you and Eugenia collaborate on the creation of the jewelry? I understand that she uses her extra-sensory abilities to amplify the healing qualities of each stone and that you incorporate those stones into your one-of-a-kind pieces. How has your work together evolved over the years? E: I never work with the stones that I do not find interesting and alive. If the stone is of this “alive type”, then I already know that it carries a lot of powerful energy myself and this is how I know which stones to use and which ones are “just pretty but empty or dead.” Sometimes Eugenia brings the stones to me – we both are always in agreement as to which stones are the right ones for what we need. Every stone has its own character and temperament. All of my work is based around the stone’s temperament – many times I have to play with the stone for a while to find what kind of metal design it likes. Each stone is unique, thus each design is unique, because each piece of jewelry is made around the stone (not like commercial jewelry making, when there are pre-set designs and the stones are simply fitted into them). My design of the pendant matches the character of that stone, thus I could never repeat the design exactly, because there is never going to be another stone like it. Once the piece of jewelry is completed, Eugenia looks through the matrix of that stone and amplifies it. Often it has to be energetically linked with the axillary stones in the design to make it work together. C: I know that you love to travel. Can you tell us how this has influenced your work? E: Every time I travel out of the country, I try to find some place to buy stones. Sometimes I know ahead of time who to talk to, but often people just notice the ring or pendant that I myself am wearing and the conversation begins, which leads to them telling me about someone who might have what I need. For example, when I traveled into the mountains of Brazil, I found a man who had access to the uncut rocks of Amethyst and a very good quality Topaz. Amethyst and Topaz are native to Brazil, and I felt very fortunate to establish a line of acquiring through that man, which I still use. Another example occurred during my trip to Alaska – there I found a man who had large rocks of Malachite – that he himself mined from the Earth – that was an incredible find! Also, in Argentina I found wonderful pieces of Rhodochrosite of a very high quality – I had to cut and polish them myself. One time I found a soldier who wrought some Lapis from Afghanistan, which was so alive and powerful – I cut and polished it myself too. C: I notice that you go through periods of incorporating different things into your pieces – sometimes you use flowers, silver beads, and in the past few years you have been incorporating more cubic zirconia. What are your design periods based on? Recently you created two very unusual pendants. One is a violin and the other is a lyre. I sense there is a story behind these. Did you have a particular inspiration for these two pieces? 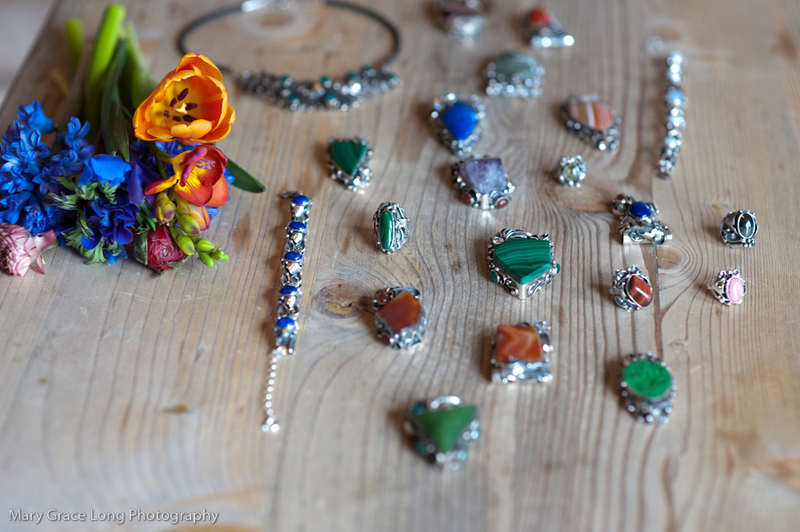 And can you tell us about the flowers you are currently incorporating into your jewelry? Eduard: Every artist evolves – I myself find that as I become older, my designs are more complex. With mastery comes freedom to create anything I want and I am tempted to experiment when I am inspired. For example, after visiting a flower show I became fascinated with lilies, recreating them in my designs. One time at a concert I was moved by a lady playing a violin, so when I returned home, I really wanted to somehow incorporate that instrument into my design. Sometimes the stone dictates the direction – looking at a piece of white Agate I saw a sail, so the design of the pendant materialized as a yacht. Many times it is the professional enhancement that drives me – I want to see if I can make something happen, and then after many trials I always succeed – this is how the roses and lilies evolved, among other things. C: I’m sure you are asked this question often, but do you have a personal favorite stone, or one particular type that you enjoy working with more than another? Your company name is Obsidian. Was there a special reason for choosing to name your company after this stone? E: Every stone has its beauty, but I love Obsidian. – It’s like a beautiful woman: I love my wife the most, but I can still admire the beauty in other women. Obsidian is my most loved stone – it is very powerful and mystical. The story behind the name of our company is this: in the Soviet Union a long time ago a surgeon asked me to make an Obsidian knife. This concept of an Obsidian knife comes from ancient Egypt – the power of Obsidian was known to the people there, and the wounds cut with an Obsidian blade healed not only quicker, but more properly, knitting the tissue together as the nature intended (what Eugenia calls the etheric body healing). I made an Obsidian blade for that surgeon, and in doing so I myself became obsessed with the stone. The first ring that I made was with Obsidian – I wore it for years as a talisman of protection (a very useful quality in Russia at that time – private business was illegal). C: Recently you created over 20 Moldavite pendants. This stone, being a meteorite, has a very powerful and intense energy. What was it like for you to work with that much of it and for so long? E: It is a very powerful stone and I found such a pleasure to work with it. During the time I worked with it, I had no pain in my body at all, and lots of energy and was able to work day and night as if I was plugged into the universe. C: Is there anything you would like admirers of your work to know? We love and appreciate your beautiful creations! Thank you for gifting them to us and to the world. E: I would like you all to remember that stones match our energy and when we like a stone, feel attracted to it, there is something in us that wants to interact with the energy/character of that stone. And, because we change throughout our lives, we might need different stone companions at different times. And of course, please take good care of the jewelry – they are like little creatures with likes and needs, and building a relationship with them is how we benefit most. Love this interview! How wonderful to hear his story❤️ Gives so much more meaning to his art!! I love my pieces. Given some as gifts. They are all so Unique & Gorgeous . Thank you Chérie for this opportunity to know him better. This is such a wonderful interview! I’m a HUGE fan of Eduard’s work and loved getting to know more about his process. Thank you both for sitting down to share this.